The second Integra I am looking at in this article is an automatic DB8. Khu bought this in very good condition as a 6 year old un-registered example, during the bottom of the currency crisis that hit Malaysia a few years ago. Everyone have since envied his extremely good luck since the price he paid at that time is actually lower than that being asked for same-aged pre-owned used examples being sold now ! Khu has always maintained to me that he intends to keep his car "stock". But I've always felt that he has a rather "flexible" definition of stock. At the time Khu sent his car for dyno, he has a K&N cone filter replacing the stock filter. B18C's stock filters are already conical in design and the K&N could be used as a direct drop-in replacement, fitting nicely into the stock air-filter box ! He also replaced his rear muffler box with one from a stock 96-Spec Integra Type-R. Finally being a reader of TOVW, he fully believes in injector cleaning and AFR benefits, so his injectors were cleaned. He also purchased a used AFR for the car. Quite a handful indeed for a "stock" DB8 ! Khu's Dynojet session came about when he was able to share a block of dyno-time with some members of our Honda club. His intention was to properly set the AFR for optimum air-fuel ratio for the local atmospheric conditions, as well as to set the base ignition timing via the distributor. Khu's dyno-chart is reproduced on the left. The base line run showed around 116ps at the wheels, with a reasonably smooth power curve, except for a dip between 6000rpm to about 6700rpm. This base-line run is for already cleaned injectors, with just the AFR and base ignition timing to be set. Adjusting the AFR plus setting the base timing allowed his DB8 to finally dyno at almost 119ps at the wheels, once again spot-on the theoretical figure ! In Khu's DB8 however, very significant gains were obtained all across the rpm range, with especially good gains in the low and mid RPMs. Being the sensible automatic driver, Khu was very impressed and happy with the gains, since almost 8ps gains were recorded in the low rpm range of between 2500 to 4000rpm. This gives the car is much more spirited character for in-town drives and especially beneficial for an automatic transmission. In Khu's case however, we need to bear in mind that the air-filter is an upgraded freer-flowing K&N unit while the muffler (exhaust back-box) is the lesser restriction stock Integra Type-R one. Nevertheless, both the items are not expected to produce great power gains, so taking into account the power dip between 6000 - 6700rpm (which could have taken the max power to 120ps and beyond), Khu's DB8 do give us confidence to peg the power of a stock automatic B18C to 119ps on a Dynojet machine. I am very fortunate in being able to establish a working relationship with the reference Integra site The Integra Dyno Center. Our agreement is one where I am able to quote or use selected material (with permission) from the site to complement and enhance my articles here, while at the same time those article will also be highlighted at the 'Dyno Center' as well. This is a very good working relationship and as a direct result of the site's generosity, I am in the unique position of being able to use material from the site to cross-check the materials I have in this article. 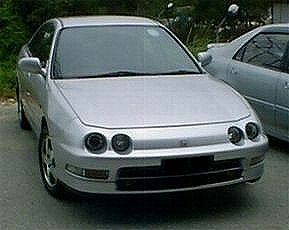 Although the site concentrated on U.S. model Integra GS-Rs, there was a record for a JDM Integra SiR-G that was imported into Jamaica. The owner reported a stock power run of 149ps at the wheels for his baseline value. This run was recorded with the car exactly as it was received from Japan and would thus corresponds directly with Mike's original (first) run of 148ps. 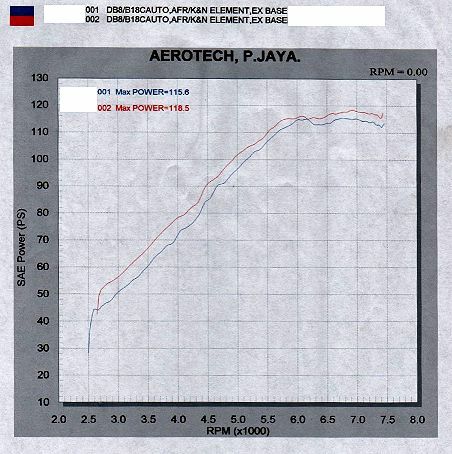 As can be seen, the two results corresponds to each other very well and this gives us full confidence that Mike's results (as well as that reported in the Integra Dyno Center) are fully representative for a typical DC2. These reference values would prove invaluable to the enthusiasts for many uses, especially when evaluating the power gain of a mod when the baseline power is not available.